We are happy to present our good friend & Key West local Laura Murphy with another guest post on our blog. After much begging on her part we finally caved in and agreed to have her write another article for us. Local flavor is what we want to present so why not?! Plus she is a pretty darn good writer as well! Please share your thoughts by leaving us a comment after reading. Back home we all have our favorite bars. We fall in love with them for the great location, warm atmosphere, cheap appetizers and great selection of beer! But you’re not at home…you’re in Key West. Now what? If you’re a music lover, The Bottle Cap Lounge and Liquor is the spot for you! This hotspot is like getting three in one: a standard pub complete with pool table, an outside patio and, my personal favorite, the lounge. It hosts dim lighting, couches and chairs for that night club feel. If you come before 9 pm, you’re likely to find music videos playing on the bar TVs. After 9 the live music or DJ kicks in. You can find micro brews here as well as great martinis. Looking for cheap domestic beer? Guy Harvey’s is the spot for you. It’s a short step away from Duval Street and offers $2 taps. The food here is good, though quite ‘spendy’. Guy Harvey’s own artwork covers the walls and you can almost always catch a game on their flat screens. Beer connoisseurs: look no further than The Rum Barrel. They have an outstanding selection of brews, both on tap and in the bottle. If you arrive by ship, it’s just a few short steps away from port and the food is fantastic! I highly recommend any menu selection containing fish. On a warm night you can sit on the quarter deck and enjoy some fabulous live music. If you’re looking for oysters you won’t find a better deal than at Half Shell Raw Bar. You can order them steamed or raw at less than $1/oyster and the seafood doesn’t stop there. They also offer clams, shrimp, crab, lobsters and lots more. We like to treat ourselves with a special combo of lobster, clams and shrimp. And don’t pass up the potato salad; it’s fantastic! Just mere steps away from Half Shell you’ll find Turtle Kraals. My personal favorite on the island is home to a wood fire grill and The Tower Bar which overlooks the Historic Seaport and offers a great view of the sunset. Daily happy hour appetizers are inexpensive and taste delicious; just be sure you’re sitting at the bar or in The Tower Bar, or you won’t get happy hour pricing. You’ll find a good selection of brews here as well, though only a few are on tap. You can sometimes catch live music, though if you’re upstairs you’ll miss out. TK’s is becoming a Friday ritual for my husband and me. I greatly enjoy some happy hour nachos or wings, a fresh crisp side salad and that fantastic view of the sunset from The Tower Bar. 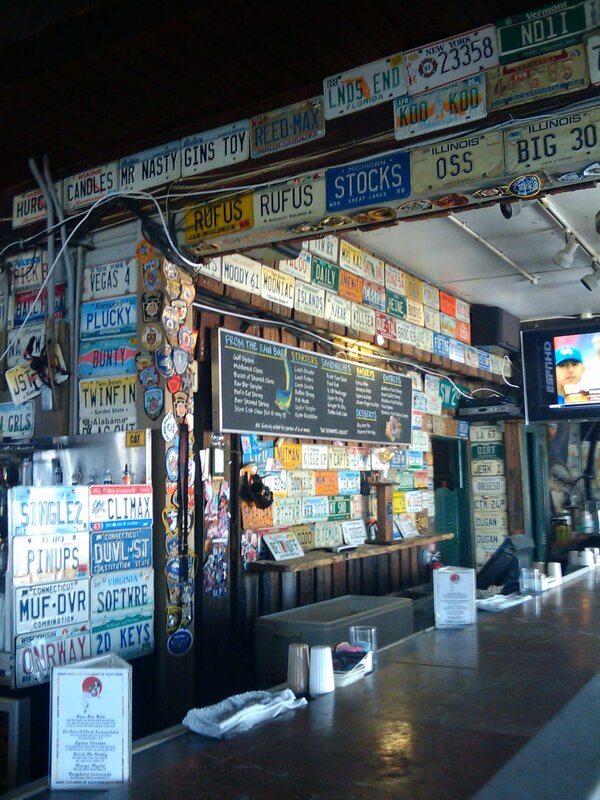 These are just a few of my personal favorites…there are plenty of great places in Key West to drink and be merry. Thanks for choosing to come to our island! 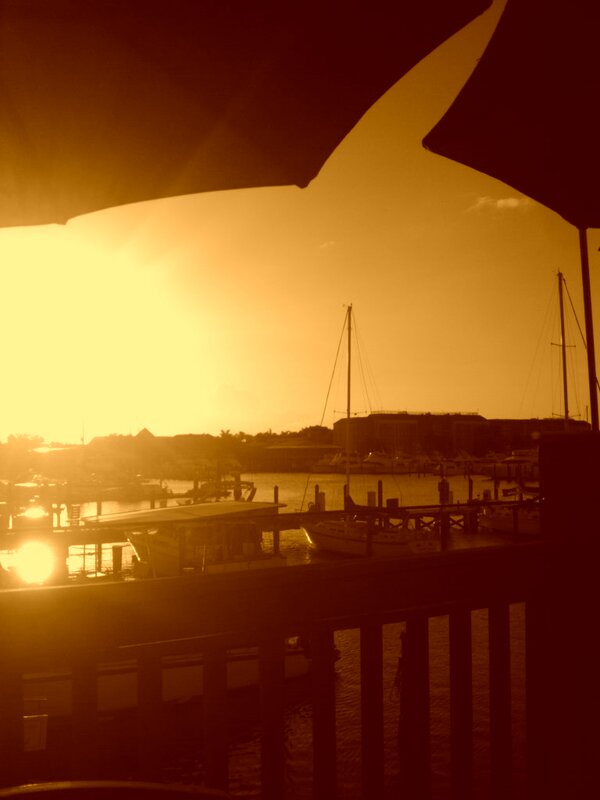 If you’d like to see and read more of Key West from a local’s perspective, check out my blog at sunshine4chloe.tumblr.com, or if you need quick local advice and @SunshineMichele isn’t available, feel free to tweet me @TheMrsMurphy. Laura & her husband moved to Key West last summer from some place up north called Minnesota and have no plans on leaving any time soon. If not watching a game on a big screen or taking a well deserved break at one her favorite spots, Laura can sometimes be heard singing backup for some of the bands in town. Be sure to ask for her autograph – it will be worth a fortune one day! Please take a moment to leave us your thoughts on this article, or perhaps on something you would like to learn more about from down here in our little part of paradise called Key West. And if you are looking for the best bartender on the island who enjoys making sure the customers are happy and entertained, go to Dons’ Place to the outside bar. Jill actually hula hoops behind the bar. I’ve known Jill for a long time, and she is always warm and friendly and always has a smile on her face and a song in her heart. Unfortunately, I do not live in Key West, but I come down every year and always go see Jill. There is also Foosball, ping-pong and some bean bag toss game that is popular at college football games. Great input Regina, thank you! As there are so many bars in Key West I think we will send Laura back out to do a follow-up and maybe another, and another and … you get the idea 😉 Let us know when you come down again and we’ll gladly help you with the pre-planning and activity bookings. Cheers! Thank you! I really appreciate this article. I’m a first time visitors to KW and will be there next month. I am happy to read about the best bars visit and details about each one, especially from a Local’s view! Great post and very helpful (as always). I’ve added all of these bars to my itinerary for when I’m down in July. It’ll be my third trip down there and it will def. be cool to expand my ‘bar wings’ a bit….yet still sticking to my old faithfuls. Well this is definitely a hot topic! Matt, please do share your ‘old faithfuls’ with us. We’d love to expand this topic into a “Recommended” list. There are so many great watering holes here which are off the beaten path and deserve some spotlight as well. With pleasure. Most of my days down in Key West begin with a stroll down to Schooners Warf for a couple of pina colada’s and the sounds of Michael McCloud. Always a relaxing way to spend the early afternoon sitting on the water w/ a cold drink and good tunes. The evenings are usually spent at Captain Tony’s enjoying a number of Pirates Punches. True, it might be a bit of tourist trap and something of a Graceland for Jimmy Buffett fans. But it’s a relaxing place to sit at the bar and have a few. The last few times I was there, the bartender, Dave, got to know us pretty well and always saw to it that we had a good time. So hope he’s still there when we’re back down in July. Depending on the crowds I’ll duck into Irish Kevin’s, a good mix of comedy, music, and drinks! But like I said, I can be a creature of habit, so I’m pumped to add these new bars to the list of places to check out. Is it July yet? Matt, thanks so much for taking the time to come back and respond; this is great! It could well be a blog post in itself. We will definitely revisit this topic. Great info! We will check out every one of these bars when we are there next month. This will be our first trip and want to make sure we take in as much as we can. "Key West and a Local’s Favorite Bars" was written May 18th, 2010	by Stormy Lynn, and filed under Dining, Key West, Leisure, Travel, Vacation and tagged Appetizers, Bars, Beer, Dining, Drinks, Duval Street, Florida, Food, Key West, Microbrew, Oysters, Restaurants, Salad, Sea Food, Travel, Tropical Island Paradise, Vacation, Vacations.